In this week’s sonographer spotlight we will introduce you to Presley Painter. She was one of our 2018 Mentor Award Winners. She was nominated by Shannon Fulerson. Shannon shared with us how Presley takes time to work with countless sonographers to teach and mentor them. “Presley takes so much of her personal time away from her family and children to ensure sonographers feel comfortable and confident in their patient care. 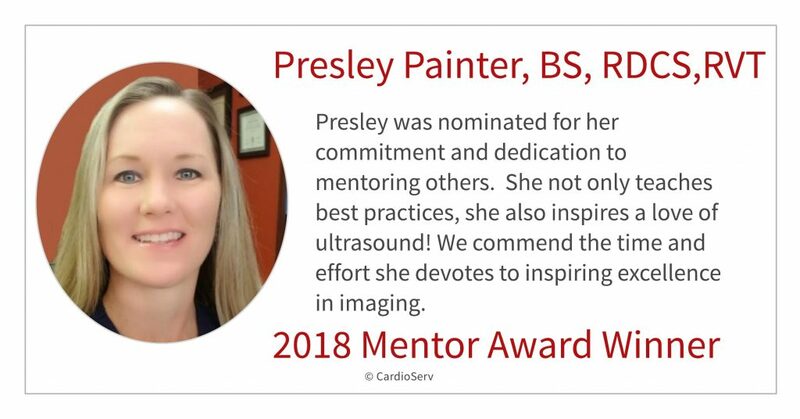 She sits down one on one and explains new concepts and encourages all of us to continue our education.” Presley’s commitment to mentoring other sonographers won her the 2018 Mentor Award for Inspiring Excellence in Imaging. I am a mother of two young children and currently live in Lexington, SC. I attended Coastal Carolina University where I obtained a BS in Public Health. 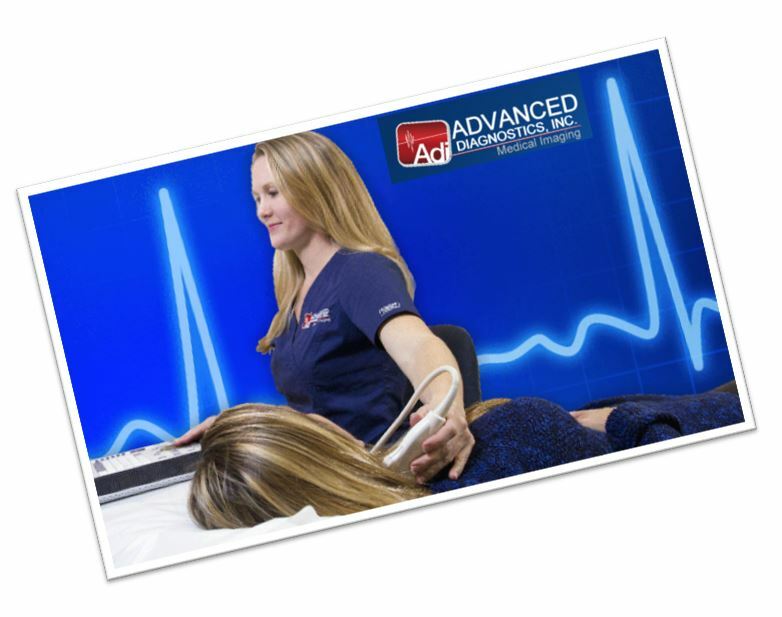 In 2003 I began my cardiovascular ultrasound training and career with Advanced Diagnostics, Inc. in Columbia, SC. I have been with the company for almost 16 years now and still love what I do. Where do you work? Current position and responsibilities? I work for Advanced Diagnostics, Inc. in Columbia, SC and currently hold the position of Chief Operating Officer. We are an independent medical imaging company specializing in ultrasound and cardiac nuclear medicine. We service patients in our own office, as well as other doctors’ offices and hospitals in the surrounding area. I have been able to work in all different types of patient settings, including vascular surgery and cardiology practices, which has given me a wide range of experience and knowledge. I still have the privilege of scanning patients almost daily, which is my favorite part of the job. I manage and oversee our accounts and sonographers. I am responsible for updating and creating contracts for new and/or existing customers and keeping up with our accreditation through the IAC. What made you decide to become a sonographer? After graduating from college I was fortunate enough to meet Steve Shroyer who offered me an opportunity to become trained in cardiac and vascular ultrasound, as well as be an assistant to his sonographers at the time. After seeing what ultrasound was all about I was fascinated, especially with the cardiac modality. I always knew I wanted to be in the medical field, but it wasn’t until I learned about cardiovascular ultrasound that I found my niche. How did you learn ultrasound? What interests you/ intrigues you about ultrasound? I received my training on the job from Advanced Diagnostics, Inc. I was very blessed to have learned among some of the best sonographers in the field. Without them and their expertise I would not be where I am today. I am intrigued by how the body all works together, specifically the pump and the pipes of our systems. Being able to see organs and blood vessels inside the body by the physics of ultrasound still amazes me. I am very fascinated by how our bodies can compensate for abnormalities, such as lack of blood flow to a certain area to provide collateral pathways or the changes our heart makes when put under pressure. You not only teach but you inspire a love of ultrasound. Why is this important to you? I feel very honored and undeserving to be nominated for this award. My motivation comes from the opportunity to give back the knowledge and experience of what others have passed on to me along the way. I feel that inspiring someone to treat and be concerned about their patients as if he or she were their own mother was the best thing ever instilled in me during my training. Also, making it my goal to figure out why the patient is having a certain symptom rather than just taking pictures per protocol is the next most important part of my job. We have the opportunity to have a positive impact on patients and being personable with them and paying attention to their needs is something we can easily take for granted over time. It’s so important not to get stuck in the daily grind where the only goal is to get finished as quickly as possible for the day. I want our sonographers to understand that quality is far more important than quantity and to help them understand how important their role is for each individual patient. I continue to learn something new every week and I always have the desire to expand my knowledge in this field. I believe we can learn something from everyone no matter what their title or how long they have been in the field. How else do you get involved with the advancement of ultrasound? I am currently the treasurer of the South Carolina Society for Vascular Ultrasound. Our goal is to provide the best speakers with the most sought-after topics each year at our annual Symposium. Through this we are able to provide educational and CME opportunities to sonographers. This position gives me a chance to network with fellow sonographers around the state and with vendors from all geographical areas. Presley truly has a passion for ultrasound and a love of teaching and mentoring others. We appreciate her commitment to inspiring excellence in imaging. Connect with Presley on LinkedIn and check out Advanced Diagnostics, Inc if you are in the South Caroline area and in need of quality ultrasound services!